This product is a 19V, 3.43A, 65 watts AC to DC wall mount adapter intended for use in AIO systems, PC systems, small pc, mini pc and Intel NUC kit and Gigabyte Mini PC. Item is equipped fixed barrel output connector with 2.5mm internal diameter, 5.5mm external diameter, 11 mm in length. It meets DOE level VI & Energy Star level V standards. FSP Quality Assurance Program, a manufacturer's direct service guarantees quality and performance for a period of 1-Year. All FSP OEM models are RoHS, Lead-Free, Green Product (G.P) global environment-friendly status compliant. 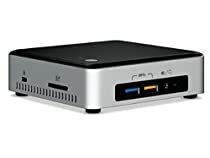 I have an i5 NUC and I have a buddy who owns the latest i7 NUC. Both came with the same power adapter --- the FSP065-10AABA. Mine lasted around 1.5 years and then the output voltage started going all over the place; from a low of 3.5 volts to a high of 16.9 volts DC. Needless to say, the stock Intel NUC power adapters are garbage. The Intel NUCs must have excellent onboard voltage regulators and I was surprised that when I connected this new power adapter (the subject of this review), my NUC booted right to the desktop, with NO ISSUES WHATSOEVER! The boot drive in my NUC is a Samsung M.2 SSD and there's an additional Samsung SATA SSD installed in it as well. Everything survived the ordeal of the stock power adapter going south on me and once again, my NUC runs perfectly. Which brings us to the FSP 65 Watt AC Power Adapter. This power adapter is EXCELLENT and is also a good buy (sells for a fair price). It is also much heavier and larger than the stock Intel power adapter, which tells me the internal parts are beefier and of higher quality. I suspect this power adapter was designed for a laptop computer, as it seems to be about the right size. The AC power cord and the DC cable are also much longer than the stock power adapter, which makes it easier to hide. I checked for ripple on the output DC plug using a digital oscilloscope, and it was in the microvolt range (nearly unmeasurable). When all is said and done, one would expect an Intel power adapter to last MUCH longer than 1.5 years, especially considering that the internal storage devices (a pair of SSDs) are SOLID STATE and pose a VERY light load, in the greater scheme of things. Obviously, Intel needs to go back to the drawing board or just 'spec' a beefier power adapter, given that the stock unit is so notoriously prone to failure. This is a VERY common problem with the Intel NUC. If you don't believe me, GOOGLE it. 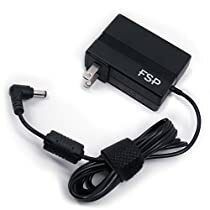 After telling my buddy about my experience with my NUC's power adapter, he ordered one of these FSP power adapters on general principle and I'm sure he'll plug it in and start using it immediately, when it arrives. I can only suggest that you do the same; order one and USE it when it shows up on your doorstep! You WON'T regret it. 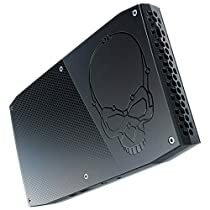 I ordered this to replace the original plug style power supply that came with my Intel NUC5i5RYH. The original made a high pitched noise with every change in power consumption. So for example, scrolling up and down a web page would cause the power supply to emit noises. Very annoying and the RMA process for Intel is cumbersome to get it replaced. I thought for $25 I might as well order a new one and not worry about it. This one a high power, better built product and it emits NO noise of any kind regardless of the load on the PC. I am very happy with it. Intel should ship this one with their product. This is an Intel NUC power supply (just like the description says). It's got the right connector, voltage and current to run any NUC I've ever seen. It's not quite as cute as the ones that come with the new NUC's. It has a "Mickey Mouse" power cord rather that the snap on connectors the new design uses. Either one works fine. They both are made by the same people. This sort of adapter will be hit or miss for a laptop. It's got a common connector on it. The wiring (center positive) is set up the way 90% of them do it. Since there are an almost infinite combination of connectors / power levels / voltage levels and signaling protocols, it's a toss up on any specific laptop.